Anil Kumble: Where does the buck stop in Kumble saga? MUMBAI: The BCCI is clearly dealing with a flawed contract with regards to the position of India’s national coach, given that it has to call for fresh applications for the role despite Anil Kumble doing phenomenally well. The BCCI, on Thursday, called for fresh applications for the position of coach for the national men’s team, allowed Kumble a direct entry into the process and announced that the three-member cricket advisory committee would look into the process of selecting India’s coach for the next term. The last time that the advisory committee came together to pick the national coach – zeroing in on Kumble – the BCCI had prepared a contract that said the coach’s term would be for a period of one year, following which a fresh set of applications would be called for. Kumble’s contract ends with the conclusion of the ICC Champions Trophy and stipulates – without any performance clause – that the board has to call for applications once again. 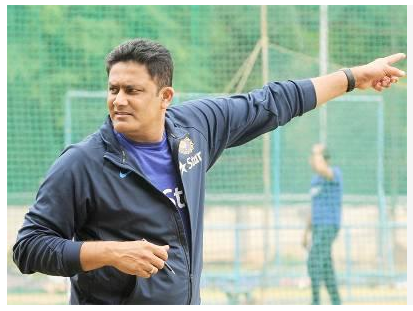 His ‘demand’ for pay-hikes and his proposal that the coach should also be playing the role of a national selector notwithstanding, Kumble the coach has been tremendously successful with the Indian team. In the last one year, under Kumble, India has won everything there was to win – which included five Test series, a one-day series and a T20I series. So, how exactly is the advisory committee going to be comfortable looking at any other candidate except for the former legspinner, who has clearly been successful? The advisory committee – comprising Sachin Tendulkar, Sourav Ganguly and VVS Laxman – has clearly been put in a spot of embarrassment, given that the three have to ‘take a call’ on their former teammate despite the fact that his cricketing achievements as coach have been very good. “The advisory committee can only look at it from a cricketing perspective, and there’s no doubt that their choice will once again be Kumble. How do they justify doing away with him? So, essentially, it is for the BCCI to suggest where they’re going with this?” a source in the know of things said. TOI had reported on Thursday that a section of board administrators weren’t very happy with Kumble’s set of demands. One individual said it smacked of unionism while another admitted that the coach was on a ‘sticky wicket’. If indeed it is about Kumble’s ‘demands’, the BCCI has clearly been unfair in putting the ball in the advisory committee’s court, considering they’re only going to look at things from a cricketing perspective. Title: Anil Kumble: Where does the buck stop in Kumble saga? 1 Response to "Where does the buck stop in Kumble saga"
Nice one, The blog seems really interesting. One can take help from the Live Now India to get the updated news regarding international, national, technology, science etc to keep yourself updated without any miss.